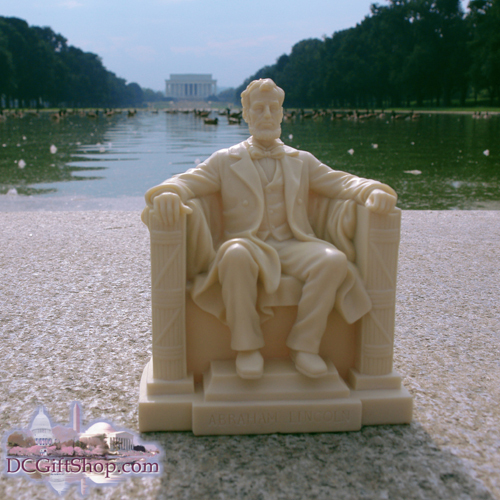 This Washington DC souvenir marble resin statue is a replica of Daniel Chester French's sculpture of Lincoln, seated. French studied many of Mathew Brady's photographs of Lincoln, and depicted the president as worn and pensive, gazing eastwards down the Reflecting Pool at the capital's starkest emblem of the Union, the Washington Monument. On the back of Lincoln's head is rumored to be the faint outline of the face of Robert E. Lee. Close inspection shows that the outline does not exist. One hand is clenched, the other open. It is said that French, who had a hearing-impaired daughter, carved Lincoln's hands to sign the letters "A" and "L" in American Sign Language. Beneath his hands, the Roman fasces, symbols of the authority of the Republic, are sculpted in relief on the seat. The statue stands 19 feet tall and 19 feet wide, and was carved by the Piccirilli Brothers of New York City in a studio in the Bronx from 28 blocks of white Georgia marble stone. The statue is approximately 5 1/4" high. Order Abraham Lincoln Statue today.